This page describes the loves of the god. Most of these, however, appear only in the ancient genealogies with no accompanying story. The most significant of the love-myths was the tale of his affair with the goddess Aphrodite. The pair were commonly depicted together in ancient art--to such an extent that she could properly be described as his consort. APHRODITE The goddess of love and beauty had a long love affair with Ares which lasted for the duration of her marriage to Hephaistos and beyond. She bore him four divine sons and a daughter: Eros, Anteros, Deimos, Phobos and Harmonia. EOS The goddess of the dawn with whom Ares had a brief love affair. She was cursed with a rampant sexuality by the jealous Aphrodite. No offspring are mentioned of this pair. ERINYS TELPHOUSIA Either one of the Erinyes or the goddess Demeter (who was titled the Erinys of Thelpousa). She bore Ares the Drakon of Thebes. From the sowing of this Drakon's teeth were born a tribe of warrior-men known as the Spartoi. PERSEPHONE The gods Ares, Hermes, Apollon and Hephaistos all wooed Persephone before her marriage to Haides. Demeter rejected all their gifts and hid her daughter away from the company of the gods. HARMONIA A nymph of Assyria (Asia Minor) who was seduced by Ares in the Akmonian Wood. She bore him the first of the Amazones tribe. TANAGRA A Naiad-nymph of Argos (isouthern Greece) whom the gods Ares and Hermes competed over in a boxing match. Hermes won the contest and lay with her. AEROPE An Aitolian (central Greece) princess loved by Ares. She bore him a son Aeropos. ASTYOKHE (Astyoche) A princess of Orkhomenos (central Greece) loved by Ares. She bore him twin sons Askalaphos and Ialmenos. DEMONIKE (Demonice) A princess of Aitolia (central Greece) loved by Ares. She bore him four sons Euenos, Molos, Pylos and Thestios. ILIA A princess of Latium (central Italy) and Vestal Virgin. She was seduced by Ares (Mars) in her sleep and bore him twin sons Romulus and Remus. PHYLONOME An Arkadian (southern Greece) princess loved by Ares. She bore him twin sons Lykastos and Parrhasios. "This winged god [Eros] rules ruthlessly throughout the earth and inflames Jove [Zeus] himself, wounded with unquenched fires. Gradivus [Ares], the warrior god, has felt those flames; that god [Hephaistos] has felt them who fashions the three-forked thunderbolts." "One day Ares came in from the battlefield brandishing a strong spear and began to make fun of Eros' weapon. Eros said ‘This one is heavy : try it and you will see.’ Ares took the javelin, while Kypris [Aphrodite] smiled quietly; and with a groan he said, ‘It is heavy : take it back.’ ‘Keep it,’ said Eros [and so presumably bound Ares and Aphrodite in love.]." Hephaistos had been cast from heaven by his mother Hera at birth, for she was ashamed at bearing a crippled son. He was rescued by Thetis and Eurynome and raised in a cave on the shores of the River Okeanos where he became a skilled smith. Angry at his mother's treatment, Hephaistos sent various gifts to Olympos including a Golden Throne for Hera. When the goddess sat upon this cursed throne she was bound fast. Zeus sought the assistance of the gods in the freeing his Queen and offered the goddess Aphrodite in marriage to the god who could bring Hephaistos to Olympos. Aphrodite agreed to the arrangment in the belief that her beloved Ares would prevail. Ares stormed the forge of Hephaistos, bearing arms, but was driven back by the Divine Smith with showers of flaming metal. Dionysos next approached the god, and suggested that he might claim Aphrodite for himself if he were to release his mother willingly. Hephaistos was pleased with the plan and ascended to Heaven with Dionysos, released his mother and wed the reluctant Love-Goddess. Image K9.4 of an archaic vase (see below) depicts the god sitting dejected as Hephaistos returns to Olympos to claim Aphrodite as his bride. The goddess herself stands apart beside the palace entrance. "There are paintings here [in the temple of Dionysos at Athens]--Dionysos bringing Hephaistos up to heaven. One of the Greek legends is that Hephaistos, when he was born, was thrown down by Hera. In revenge he sent as a gift a golden chair with invisible fetters. When Hera sat down she was held fast, and Hephaistos refused to listen to any other of the gods [including Ares] save Dionysos--in him he reposed the fullest trust--and after making him drunk Dionysos brought him to heaven." Thus he spoke, and the gods came thronging there in front of the house with its brazen floor. Poseidon the Earth-Sustainer came, and Hermes the Mighty Runner, and Lord Apollon who shoots from afar; but the goddesses, every one of them, kept within doors for very shame. Thus then the bounteous gods stood at the entrance. Laughter they could not quench rose on the lips of these happy beings as they fixed their eyes on the stratagem of Hephaistos, and glancing each at his neighbour said some such words as these : ‘Ill deeds never prosper; swift after all is outrun by slow; here is Hephaistos the slow and crippled, yet by his cunning he has defeated the swiftest of all the Olympian gods, and Ares must pay an adulterer's penalty.’ . . .
Poseidon who shakes the earth replies : ‘Hephaistos, if Ares indeed denies his debt and escapes elsewhere, I myself will pay what you ask.’ Then the great lame craftsman answered him : ‘I must no and cannot refuse you now,’ and with that he undid the chains, powerful though they had proved. Unshackled thus, the lovers were up and off at once; Ares went on his way to Thrake, and Aphrodite the laughter-lover to Paphos in Kypros." "Demodokos at the Phaiakian court sings of the armours of Ares and Aphrodite, not in approval of such passion, but to deter his hearers from illicit desires, or else because he knew that they had been brought up in a luxurious mode of life and therefore offered for their amusement what was most in keeping with their character." "[From Plato's critique of the portrayal of the gods in Homer :] Nor will it profit them to hear of Hephaistos' fettering Ares and Aphrodite for a like motive [i.e. for passion]." "[Poets] recite your rhapsodies . . . and tell them how . . . Ares, the most warlike of the gods, was first enchained in heaven by Hephaistos." "Her head darkly mantled in her veil . . . with cheek shame-crimsoned, like [Aphrodite] the Queen of Love, what time the Heaven-abiders saw her clasped in Ares' arms, shaming in sight of all the marriage-bed, trapped in the myriad-meshed toils of Hephaistos: tangled there she lay in agony of shame, while thronged around the Blessed, and there stood Hephaistos' self : for fearful it is for wives to be beheld by husbands' eyes doing the deed of shame." "When Vulcanus [Hephaistos] knew that Venus [Aphrodite] was secretly lying with Mars [Ares], and that he could not oppose his strength, he made a chain of adamant and put it around the bed to catch Mars by cleverness. When Mars came to the rendezvous, the together with Venus fell into the snare so that he could not extricate himself. When Sol [Helios the sun] reported this to Vulcanus, he saw them lying there naked, and summoned all the gods who saw. As a result, shame frightened Mars so that he did not do this. From their embrace Harmonia was born, and to her Minerva [Athena] and Vulcanus [Hephaistos] gave a robe ‘dipped in crimes’ as a gift. Because of this, their descendants are clearly marked as ill-fated." "Sol (the Sun) [Helios] is thought to have been the first to see Venus' [Aphrodite's] adultery with Mars [Ares] : Sol is the first to see all things. Shocked at the sight he told the goddess' husband, Junonigena [Hephaistos], how he was cuckolded where. Then Volcanus' [Hephaistos'] heart fell, and from his deft blacksmith's hands fell too the work he held. At once he forged a net, a mesh of thinnest links of bronze, too fine for eye to see, a triumph not surpassed by finest threads of silk or by the web the spider hands below the rafters' beam. He fashioned it to respond to the least touch or slightest movement; then with subtle skill arranged it round the bed. So when his wife lay down together with her paramour, her husband's mesh, so cleverly contrived, secured them both ensnared as they embraced. Straightway Lemnius [Hephaistos] flung wide the ivory doors and ushered in the gods. The two lay there, snarled in their shame. The gods were not displeased; one of them prayed for shame like that. They laughed and laughed; the joyful episode was long the choicest tale to go the rounds of heaven." "Among these [the nymphs] Clymene was telling of of Vulcanus' [Hephaistos'] baffled care, of the wiles and stolen joys of Mars [Ares]." "[Aphrodite] the daughter of Jupiter [Zeus] and Dione, wedded Vulcanus [Hephaistos], but is said to have been the mother of Anteros by Mars [Ares]." "The Lemnian [Hephaistos], so they of old believed, long time distressed at Mars' [Ares'] deceit and seeing that no punishment gave hindrance to the disclosed armour, and the avenging chains removed not the offence [of his affair with Hephaistos' then wife Aphrodite], wrought this [a cursed necklace] for Harmonia [the daughter born of the love affair] on her bridal day to be the glory of her dower." "Once on a time, where the milky region is set in a tranquil heaven, lay kindly Venus [Aphrodite] in her bower, whence night had but lately fled, faint in the rough embrace of her Getic lord [Mars-Ares] . . . Weary she lies upon her cushions, where once the Lemnian chains [of Vulcan-Hephaistos] crept over the bed and held it fast, learning its guilty secret." "Venus [Aphrodite], detesting the offspring of the hated Sol (the Sun) [Helios], is avenging through us the chains that bound her to her loved Mars [Ares]." "Both the parents of Harmonia, Ares and Kythereia [Aphrodite], who mounted one bed, were of one father, another pair of blood-kindred." "Aphrodite wishing to delight Ares in the deep shrewdness of her mind, clasped a golden necklace showing place about the girl's blushing neck [a gift to their daughter Harmonia at her marriage to Kadmos], a clever work of Hephaistos set with sparkling gems in masterly refinement. This he had made for his Kyprian bride, a gift for his first glimpse of Archer Eros (Love) [born to Aphrodite the wife of Hephaistos but fathered by her lover Ares]. For the heavyknee bridegroom always expected that Kythereia would bear him a hobbling son, having the image of his father in his feet. But his though was mistaken; and when he beheld a whole-footed son [Eros] brilliant with wings like Maia's son Hermes, he made this magnificent [cursed] necklace." Helios : After the death of Hephaistos [Ptah], the king of Egypt, Helios [Ra] his son took the rule . 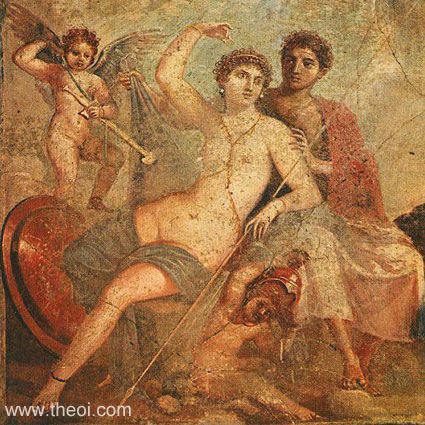 . . Helios, then, maintained the laws of his father, and denounced his wife when he discovered she had been debauched. Homer changed this to make it poetic, saying that the sun (helios) exposed the fact that Aphrodite had lain with Ares, calling her desire ‘Aphrodite’ and the soldier who was caught with her ‘Ares.’"
Aphrodite was described as the usual consort of the god Ares, including in the Iliad of Homer, where she is replaced as the wife of Hephaistos by Aglaia. The story of Aphrodite's marriage to Hephaistos may have ended in divorce: in Homer's story of her affair, Hephaistos threatens to return her to Zeus and demand back the bride price he has paid. In art Aphrodite is almost always depicted as the consort of Ares: including depictions of the wedding of Peleus and Thetis, the Gigantomachia, the Trojan War, and of the gods feasting on Olympos. "Kythereia [Aphrodite] bare to Ares the shield-piercer Phobos (Panic) and Deimos (Fear), terrible gods who drive in disorder the close ranks of men in numbing war, with the help of Ares, sacker of towns: and Harmonia whom high-spirited Kadmos made his wife." "Apollonius makes Eros child of Aphrodite . . . Simonides makes him child of Aphrodite and Ares." "Simonides makes him [Eros] child of Aphrodite and Ares. ‘You cruel child of guileful Aphrodite, whom she bore to . . . Ares.’"
"Ares, the partner of Aphrodite's bed." "Aphrodite glorious-crowned, the Bride of [Ares] the strong War-god." "[Depicted on the chest of Kypselos dedicated at Olympia :] There is also Ares clad in armour and leading Aphrodite. The inscription by him is ‘Enyalios.’"
"From Venus [Aphrodite] and Mars [Ares] [were born], Harmonia and Formido (Fear) [Phobos]." "Where the milky region is set in a tranquil heaven, lay kindly Venus [Aphrodite] in her bower, whence night had but lately fled, faint in the rough embrace of her Getic lord [Mars-Ares]. About the posts and pillows of her couch swarm a troop of tender Amores (Loves) [Erotes]." Ares had an affair with Eos, the goddess of the dawn. The Aionian Drakon guarded Ares' sacred Ismenian spring near Thebes. It was slain by the hero Kadmos who sowed its teeth, birthing a crop of fully-armed and grown warriors, known as the Spartoi. The Drakon was said to have been a son of Ares and the Erinys Telphousia. She was probably the goddess Demeter who was worshipped under the title of Erinys in the Arkadian town of Thelpousia. She was also the likely mother considering the method of the Drakon's offspring's, the Spartoi's, birth - born from the ploughed furrows of the earth. Ares and the Erinys Telphousia are named as the parents of the Drakon by one of the ancient Scholiasts, not currently quoted here. "All that dwelt in Olympos were bewitched by this one girl [Persephone], rivals in love for the marriageable maid, and offered their dowers for an unsmirched bridal. Hermes . . . offered his rod as gift to adorn her chamber. Apollon produced his melodious harp as a marriage-gift. Ares brought spear and cuirass for the wedding, and shield as bride-gift [but all their offers were declined by her mother Demeter]." "Of these nine daughters [of Asopos carried off by gods] . . . Tanagra [eponym of the Boiotia town], was seized by Hermes." "For your [Tanagra's] sake Hermes boxed against Ares." "On the right of the road [from Tegea, Arkadia through the Manthouric Plain] is a small mountain called Mount Kresios, on which stands the sanctuary of Aphneios. For Ares, the Tegeans say, mated with Aerope, daughter of Kepheus, the son of Aleus. She died in giving birth to a child, who clung to his mother even when she was dead, and sucked great abundance of milk from her breasts. Now this took place by the will of Ares, and because of it they name the god Aphneios (Abundant ); but the name given to the hill was, it is said, Aeropos." 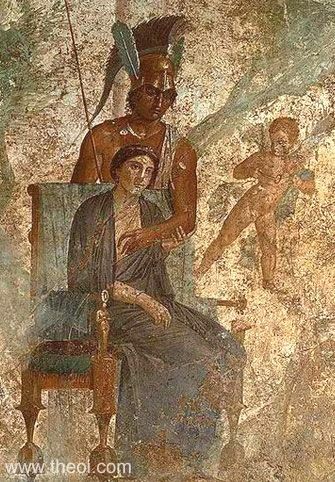 "Askalaphos led these [the men of Orkhomenos in the Trojan War], and Ialmenos, children of Ares, whom Astyokhe bore to him in the house of Aktor Azeus' son, a modest maiden; she went into the chamber with strong Ares, who was laid in bed with her secretly." "Askalalphos and Ialmenos, sons both of Ares." "[Argonauts] Askalaphos and Ialmenos, sons of Ares." "[Suitors of Helene:] Askalaphos and Ialmenos, sons of Ares." "The kingdom of Orkhomenos was taken by Askalaphos and Ialmenos [after the death of their cousin Trophonios], said to be sons of Ares, while their mother was Astyokhe, daughter of Aktor, son of Azeos, son of Klymenos. Under the leadership of these the Minyans marched against Troy." "Sons of Mars [Ares] . . . Ascalaphus. Ialmenus." "As it is said in Hesiod in the Catalogue of Women concerning Demodoke the daughter of Agenor: 'Demodoke whom very many of men on earth, mighty princes, wooed, promising splendid gifts, because of her exceeding beauty." "Demonike [daughter of Agenor, son of Pleuron king of Pleuron in Aitolia] bore to Ares Euenos, Molos, Pylos, and Thestios." "Phylonome, the daughter of Nyktimos and Arkadia, was wont to hunt with Artemis; but Ares, in the guise of a shepherd, got her with child. She gave birth to twin children and, fearing her father, cast them into the Erymanthos [River]; but by some divine providence they were borne round and round without peril, and found haven in the trunk of a hollow oak-tree. A wolf, whose den was in the tree, cast her own cubs into the stream and suckled the children. A shepherd, Gyliphos, was witness of this event and, taking up the children, reared them as his own, and named them Lykastos and Parrhasios, the same that later succeeded to the throne of Arcadia. So says Zopyros of Byzantium in the third book of his Histories." "Those suckled by animals . . . Romulus and Remus, sons of Mars [the Roman Ares] and Ilia, by a she-wolf."